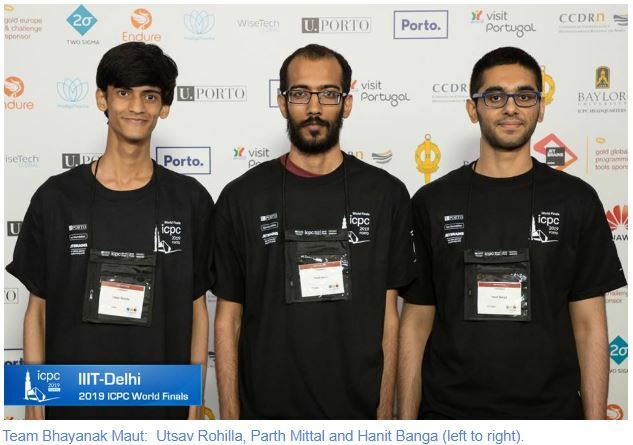 Recently, Parth Mittal, Utsav Rohilla, and Hanit Banga brought glory to IIIT Delhi by securing rank one in ACM ICPC Regionals, and thereafter, representing India in the World Finals. 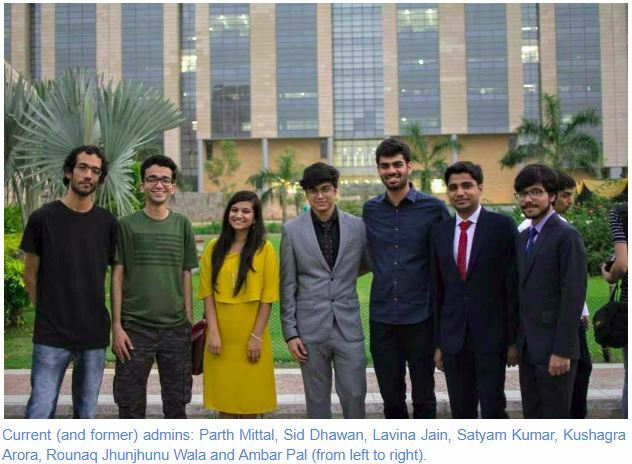 Harsh Manocha (Class of 2016) had envisioned a team from IIIT Delhi to achieve this goal by 2019 rightly so; the team members’ talent and dedication put them on the global charts. 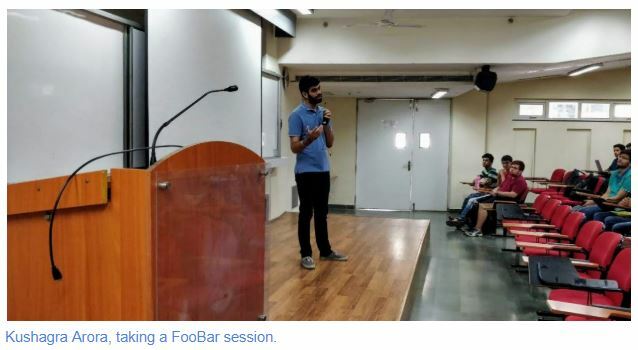 With little introduction needed, FooBar, IIIT Delhi’s Programming Club, has progressed exponentially since its conception in 2013. 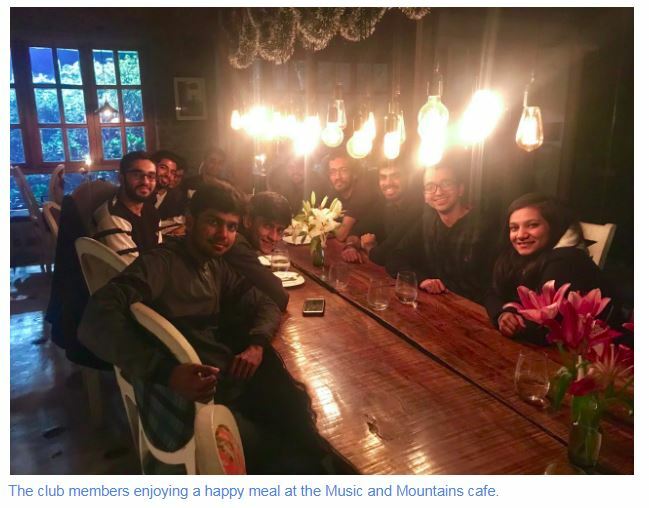 Maintaining its stature as one of the toughest clubs in IIIT to get into, the club began with the aim of promoting programming culture in the campus. It was unfurled on January 22, 2013 with an initial agenda involving weekly sessions and monthly competitions for the members of the club — something the club has stayed true to even today. The agenda also promised support for ACM ICPC, which has been an yearly phenomena for the club — evolving bright, inquisitive students into coding champions through focussed effort pooled in by all the members. Pre FooBar, there was an active mailing list with Dr. Debajyoti Bera, Assistant Professor at IIIT Delhi, sending across problems for interested students to solve and discuss. The campus also had a special post in the Student Council called ‘Technical Secretary’, who would be responsible for organizing coding competitions. “[As the Technical Secretary], I and my team realised the need of a structured, more vigorous coding culture in the institute. This is how Byld and FooBar were born. 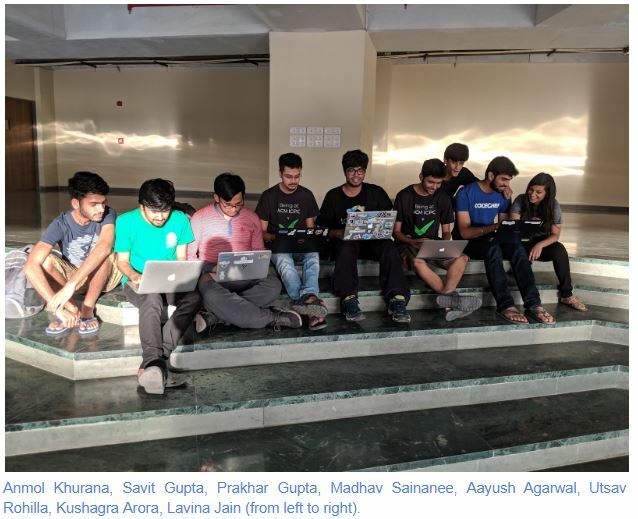 In fact they were two factions of the same people who wanted a stronger programming culture,” said Utkarsh Gupta (Class of 2015), who was one of the forerunners of the club. The club, he explained, was the brainchild of careful thought and early experimentation. Once the blueprint was ready, the club instantly garnered an approval from Dr. Pankaj Jalote, former Director of IIIT Delhi, and secured server space to host multiple softwares to check programming competitions and to maintain a backup of archived questions. 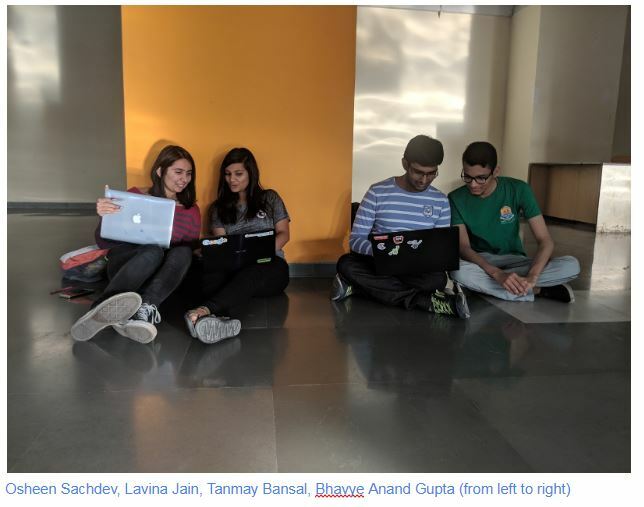 The club’s first co-ordinators included Deepankar Aggarwal (Class of 2014), currently a software engineer at Facebook; Maneet Singh (Class of 2015), currently a Ph.D. student at Image Analysis and Biometrics (IAB) Lab; Amol Verma (Class of 2014); Sampoorna Biswas (Class of 2014), currently a software developer at Clir; Harsh Manocha (Class of 2016), currently a software engineer at Google; and Kshitiz Bakshi (Class of 2014), currently a computer scientist at Adobe. Stepping into competitive coding can be daunting task for a novice, so when the founders kick-started the club, their own academic and professional backgrounds in engineering and tech guided its structure. CodeClasses are focussed on strengthening both theoretical fundamentals and facilitate ease of translation to code. In order to provide a fully hands-on experience for, their pedagogy falls on a few fundamentals — being engaging, involving teamwork and of course, having lots of fun in the process. The club promotes multi-directional learning, where all members contribute to share their own strengths with everyone else, aiming to elevate others to the same level of comprehension as their own. The primary incentive is learning. This is perhaps one reason why, even though having a tight circle of only 39 current members, the club is one of the most active in the institute. FooBar’s Facebook page has over 2,500 likes, and each of its posts gather approximately 25-30 likes on an average. The social media presence of the club shows that it speaks to a particularly receptive audience; now more than ever, with the increase in the intake of B.Tech students from cross-disciplinary fields such as Computer Science and Design (CSD), Computer Science and Biosciences (CSB), and Computer Science and Social Sciences (CSSS). Today’s world values problem solving and managing stressful deadline-driven situations on both corporate and business fronts, lending students who excel at programming an edge in hiring processes. The expansion of the Mentorship Program at IIIT Delhi along with increased interaction and informal discussion has created a direct link between freshers and seniors. Freshers, now aware of the perils and promises of the tech scenario, are motivated to gain speed, discipline and teamwork — skills that are indispensable to lasting careers in tech. The club coordinators have come up with various innovative solutions to keep the enthusiasm up. 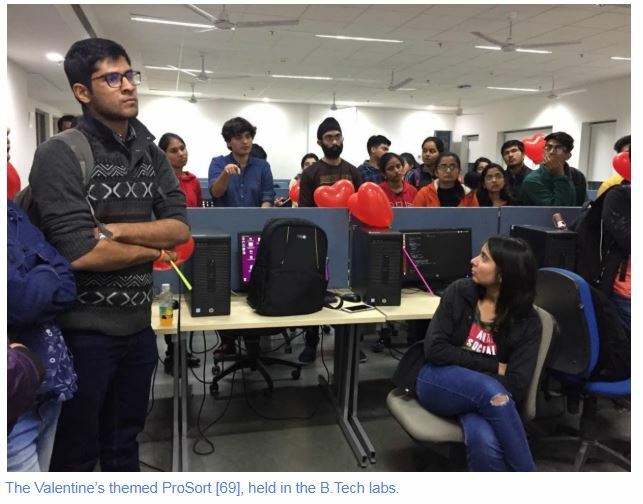 ProSort , Valentine’s Special, held on February 14, 2019, encouraged students to pair up and solve problems based on the idea of April Fool’s Contest on Codeforces. Replete with an ambience of heart-shaped balloons and a ‘weird’ problem set, this special ProSort was a unique experience for the participants. Valentine’s Special has in fact been a tradition that has been going on for the past couple of years and has attracted special attention among the programming community. The club also organizes ACM ICPC Mock Contests, CodeClasses on topics ranging from recursion to segment trees, Recruitment Contests, workshops and Summer Boot Camps. It also saw a successful INOI workshop this academic year. For a tight circle of just a handful of members, FooBar has spawned a massive outreach, evident from the usage of the portal for ADA labs to conducting ProSort Junior during Esya, which provides brownie points for high school students towards admission into IIIT Delhi. The club is presently being jointly administered by Siddharth Dhawan, Parth Mittal, Lavina Jain, Shashwat Chaudhary, Kushagra Arora, Raghav Sood, Prakhar Gupta and Tanmay Bansal. Lavina Jain (Class of 2020) is one of the few women FooBar admins and an ardent proponent of the coding culture that FooBar promotes. A former software intern at Google and a Google Code Jam to I/O winner, she spoke to the many young women trying to make it big in the competitive sphere, “We try our best to encourage girls from our institute to code, mostly from the first and second years because that is when they need to put in the most effort. There are a lot of programs to promote girls in the field, and I think we have succeeded in making girls aware of such opportunities and helping them get the required skills and mentorship for the same. The number of IIIT Delhi girls succeeding in such programs has jumped significantly in the past 2-3 years. This time, 7 girls were among the winners of Google Code Jam to I/O, as compared to 3 in the year 2016.” With an assortment of students from both B.Tech and M.Tech programs, mostly from CSE, ECE and CSAM branches. FooBar runs across disciplines and programs to provide a multidimensional training experience for all. “We are hoping to create an inclusive community where people who love to code, and those would love to code, can share a healthy atmosphere of discussions, mentorship and encouragement,” says Shashwat Chaudhary (Class of 2019). The club enforces strong ethics in coding culture, provides a supportive environment and nurtures motivation in young minds. It is not wrong to say that the club works on tapping the best talent from the heart of the institute.